As with our company ethos, some things never change or do they? and after 30 years of having our administrative headquarters in Borehamwood, Hertfordshire we have moved. As mentioned in previous newsletters, OCS’ strategy has always been to locate offices and therefore delivery capacity close to our clients. Over the years this has led to offices being set-up outside of our main UK Headquarters and Dutch Headquarters in 's-Hertogenbosch in areas such as Leeds, Milton Keynes, Edinburgh and Geneva to name just some. Today, with UK offices in London, West Sussex, Buckinghamshire, and Essex we are pleased to announce that we have moved our UK Headquarters to...you guessed it...Borehamwood, Hertfordshire. Last week, I was having lunch with a long standing client, who had recently been to our 30th Anniversary celebration evening in London. He remarked how amazing it was that we should continue to thrive as an independent consultancy after so many years and that there should be so many clients and staff, current and ex, who remain part of our network and wish to be associated with OCS. I reminded him, that though he has been a client for nearly 10 years, we had met some years before when he came for an interview at OCS as we were recruiting for a Senior Programme Manager to head up a Chip & Pin accreditation project we were running for a major retailer. He didn’t get the job… but some years later came to us to provide flexible Web Development and Infrastructure Support Services for his organisation, a large US internet subscription company which we have been delivering to ever since. I asked him what was it that reminded him of us, so much so, that he came to OCS for IT services. Now there’s a question? His answer was what I wanted to hear and perhaps the reason why after 30 years OCS remains a thriving independent business. He liked us. He liked our ethics and values and the way we communicated and dealt with him then as a prospective staff member and since then as a client. We deliver, are loyal, trustworthy, have integrity and above all else committed to making sure that as an OCS client he feels that we go the extra mile to provide the most flexible and quality service that we can. 30 years ago Neil Lawrence, founded OCS, after spotting the opportunity to deliver high quality, flexible services in the areas of lifecycle skills, technology and solutions with an ethos of honesty, integrity, friendliness and professionalism. These characteristics have been renewed, updated and re-confirmed again and again over the years. Today they are strong as they ever were, seems like in a changing world this remains a strong and attractive proposition. If you should like to experience OCS and would like to know how we may be able to assist with your future IT needs, then do please contact us and we will be delighted to help. In the Winter 2013 edition, we were able to talk in detail about the variety of services that OCS is able to deliver. For example, undertaking complex Java Development projects through to robust support of legacy systems with a core of flexible resourcing solutions, and how we delivered these services to some of the most well-known companies in the UK and Europe presented for us a huge sense of pride. 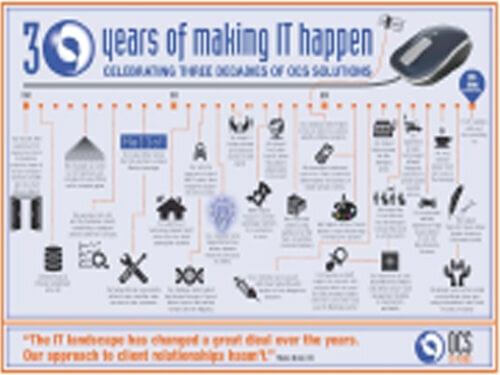 In order to record this information and as part of our 30th anniversary celebrations we have captured some of these in both Infographic and storyboard form on our new anniversary showcase site www.ocs-consulting.eu. Do please visit and review our credentials and testimonials at your leisure. In addition, as we have been trawling through our archives looking at our history we have also captured some company facts which gives an overview of OCS from a staff and services perspective. Click on the left-hand image to view for further information. Lastly, we have a diary of events planned for the remainder of our anniversary year which we would be delighted if you are able to attend, details for each event are on the www.ocs-consulting.eu website. We hope to see you at one of our planned events! A recurring theme for OCS over the last few years has been our commitment to long standing technology partners. An excellent example of this is our work with SAS software from the SAS Institute which continues to power ahead as the leading business analytics technology in use today, delivering significant business advantage to its clients. From our early beginnings in the 90’s delivering reporting, forecasting and analytics projects for banks, retailers and energy providers, OCS’ SAS services have gone from strength to strength. Based in Holland and one of our most significant and successful service streams, OCS is working with international Pharmaceuticals, Banks, and Food organisations delivering reporting, analytics, statistical and administration services and solutions. It’s no surprise therefore that as part of our 30th anniversary, OCS will be placing special emphasis on attending and sponsoring a number of SAS events across Europe to celebrate our commitment and loyalty to our SAS clients. This year’s annual PhUSE conference is being held on 12th-15th October at the Grange Tower Bridge Hotel, London. As with previous years OCS will have an exhibition stand and this year we are also proud sponsors of the PhUSE poster session on the evening of 14th October, please come and join us for a chat and some cheese and wine! I believe Marketing specialists are very focussed on Brand as the vehicle through which companies promote themselves in the market place. Be it the logo, colour, tone of voice, or statements, it is the Brand that creates an association with a company and reflects your expectations of what you will get when you interact with that company, be it, luxury, quality, service etc. As an experiment we have looked back at many of the statements or tag lines OCS have used over the years to see how consistent we have been with our company brand characteristic.